Microsoft’s SharePoint, the market-leading instrument for orchestrating company intranets. It’s used by over 80% of Fortune 500 companies to improve internal communication, boost teamwork and engagement, increase productivity, and simplify access to data and vital information. No wonder it’s the number one collaboration platform. While the tool has been adopted by a tremendous range of organizations, it seems to be lacking one component: proper analytics. The trouble is, built-in SharePoint analytics offers some level of reporting but the data is limited. This makes it hard to get the depth of reports you really need. The good news is, you can solve this issue with more advanced dedicated analytics software. We’ll show you how to do it. Moreover, in this post we’ll guide you through SharePoint dashboards, usage reports, and metrics you can take advantage of to leverage the potential of your platform. So, off we go. Since you can’t rely on the platform’s out-of-the-box analytics alone, you should consider getting an external SharePoint reporting tool like what Piwik PRO offers. This kind of solution offers you essential insights on everything going on within the platform. Apart from that, you can work directly with raw data by connecting to the Piwik PRO database and pull the data to use it in further analysis – for example, in Tableau or Power BI. How about taking integration to another level? You just need to incorporate a tag management system. That’ll speed up analysis and provide you with more accurate reports based on real-time data. Furthermore, it’s up to you when all these reports are scheduled and sent. You can do it daily, weekly, or monthly. Just choose the format you want – HTML, CSV, PDF – and send them via email. Such reports can also be pulled on demand over API. In addition, you’ll be able to work with the collected data outside the application. Piwik PRO lets you export data via an HTTP API, providing you with raw datasets that are the cornerstone of quality reports. Dashboards require little introduction. They are a perfect way for displaying the most up-to-date status of your KPIs. The way they present data depends on the software you integrate with your platform. Integration of the Microsoft platform with your Piwik PRO instance gives you flexible dashboards that can be adjusted to your precise needs and preferences. You can have customized views composed of multiple reports. In addition, Piwik PRO lets you create many SharePoint dashboards with different layouts and switch between them in just a few clicks. Then, you can easily share the configurations with your colleagues. What activities they engage in. Through access to Visitor Profiles, Goals, and Site Search you’ll have those insights at your fingertips. You’ll be able to specify user activity at the individual, department, regional or any other level you choose for segmentation. That lets you identify users with the highest engagement and find areas that require more improvement. What’s more, a dedicated analytics software gives you a handy way to measure and analyze all your site collections separately or at once by merging their data through the Meta Sites feature. This simplifies the whole process of reviewing and analyzing data. For instance, you may have a few different site collections with different kinds of resources, but overall you’d like to see which ones are the most popular. You can create a Meta Site, which offers you a clear overview of all the sites you track displayed in one SharePoint dashboard. That’s a true time-saver as you don’t need to go through every site individually, but get all the necessary information aggregated in one place. Since the platform serves as your main hub for company news, information, and a host of updates, you need to make sure that users can easily navigate using keywords. This is done by using the Site Search reports at your disposal. Referrer reports help you see how employees move across intranet applications. In this way, you learn how people use other internal sites, knowledge bases, emails, or ticketing system to reach particular content. You can use these reports to verify which source is best used for directing users to SharePoint. Efficient use of your digital workspace involves getting the timing right for certain activities and initiatives. For instance, when you publish a new policy, a survey, or need to communicate a crucial message to your employees, the key is to do it when everyone is using the platform. This is where Times reports come in handy as they show you on what days and times people are making the most use of your SharePoint. Measure access and views of your internal documents, recordings, and comments, and compare the results across time. Since SharePoint is a vital collaboration platform, you want to get the most out of it. In other words, as you publish and update your content, you want everyone involved to notice it. Examine intranet usage by office. Quickly set up the Organisation feature by assigning internal IP addresses or IP ranges to branch locations. With that done, you can segment your data based on office location and analyze goals and other reports in detail. Analyze activity across all offices and compare them using the Comparison Dashboard. A Concurrent Visits report shows the exact moments during the day when people use SharePoint the most. It tells you exactly how many active visits your SharePoint pages get over a short period of time. You can select a time as short as a single minute. These insights let you schedule your key content to be published at peak times, boosting its impact for your business strategy. Executives can use this information to plan important announcements and updates. To measure the effectiveness and usefulness of your digital workspace, you need to start with a good baseline and know exactly what you need to measure. In this context, treat SharePoint metrics as a tool, guidance to learn what areas need to improve. They let you see how people use the platform to their advantage and then identify new capabilities that open up to your business. We’ll present you some vital metrics you can apply to identify pain points and address them on the spot. 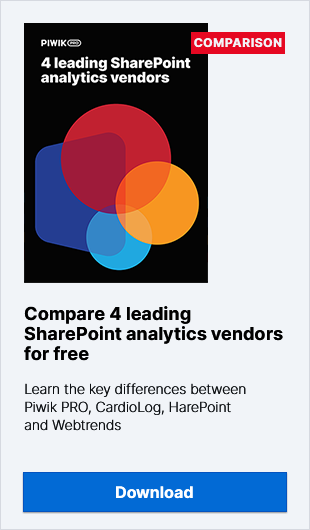 Piwik PRO Sharepoint Analytics offers you hassle-free set up. It automatically captures events of adding and editing a page as well as uploading new documents. Those events are tracked as goal conversions so you can later see a distribution of those events by user and department, or by other custom identifiers you select. Download a specific file (e.g. annual report). Once users perform these actions, you can trace their path to reaching these goals using a ClickPath report. These metrics shed light on how users flow through key points to complete a desired action. Practical SharePoint Analytics Use Cases. There are various ways to see if SharePoint fosters productivity and where you need to introduce some tweaks. One of them is to measure how much time employees spend using SharePoint in general or viewing a particular SP page. Maybe the content is hard to read or simply too long. By analyzing these reports you can ensure the platform is being used to generate good communication and efficiency within your team. Whether it’s an internal or external site, knowledge about the most active users is always valuable. You can reward the most engaged ones and look for ways to inspire others to follow. How to find out which user, department, job title, and office location gets involved the most? Each of these can be attributed in a SharePoint User Profile. These profiles are assigned to each user’s session. Later on, the data is provided with all the relevant metrics, serving as one of the dimensions you can browse your Goals data with. Additionally, you can segment each available report based on these attributes. If you want to see your company’s intranet thriving, serving its purpose of enhancing engagement and spurring productivity, you need to analyze it piece by piece. To accomplish this goal you need the right analytics software that lets you decide what data you want to collect for precise reports and analysis, not just broad-brush solutions. With this foundation you’ll be able to measure what truly matters and design a more effective business strategy. If you would like more details on SharePoint reporting offered by Piwik PRO, get in touch with our team.